I am very proud of my sketch for today’s watercolor study. I practiced on a sketch pad until I had it down. And it was just one line! Paul Klee would be so proud. I wanted to continue the theme of depicting mental processes. Yesterday’s study was my rendition of daydreaming; the study I painted day before yesterday was an example of one night’s sleep. 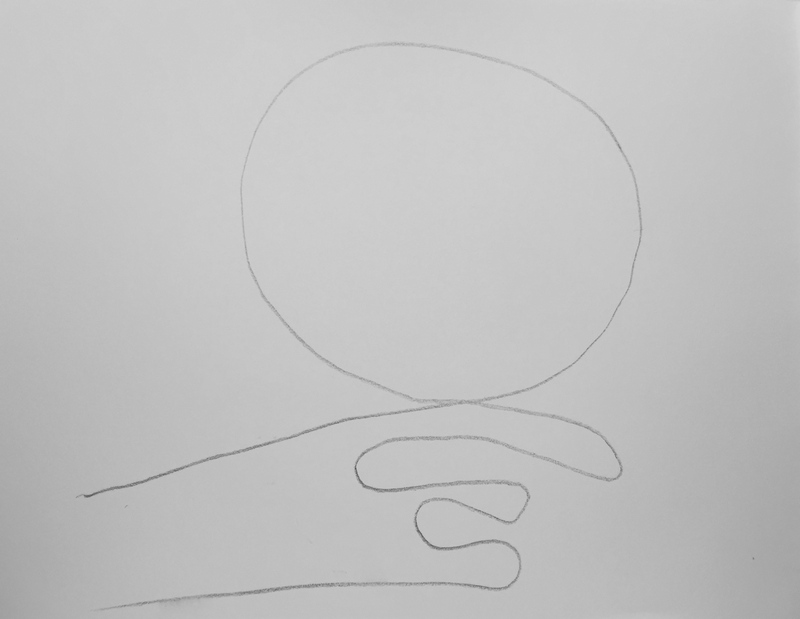 As I mentioned above, this study began with a very faint one-line sketch. I washed the top of the composition with indanthrone blue, trying to stay outside the pencil line. Since this pigment is non-staining, I was able to blot up any errant brush strokes. 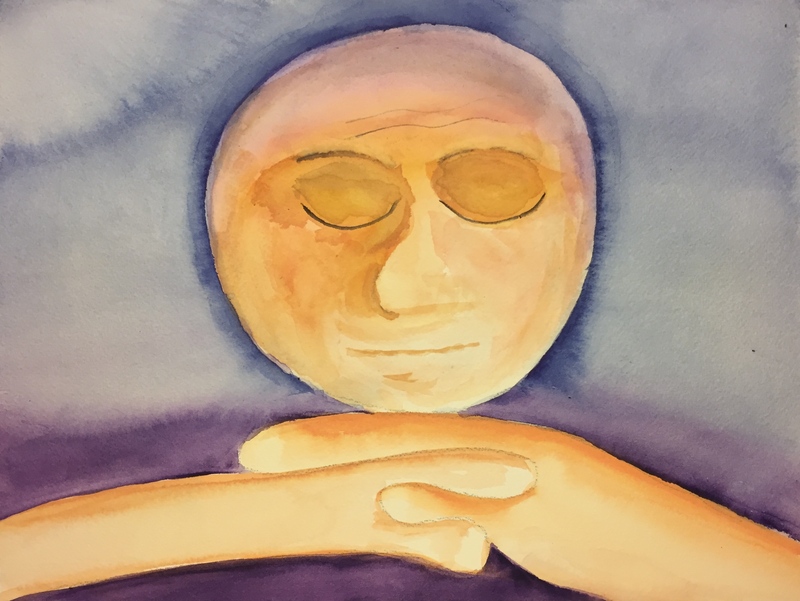 To avoid an abrupt transition from the blue of the background to the color of the face, I painted inside the circle with permanent mauve and blended it with a soft brush. While that was drying, I used my flesh tone formula (cadmium red light, yellow ochre and titanium white) along the edges of the interdigitated hands. Clear water drew away some of this pigment to achieve an even transition to white. Permanent mauve underneath the clasped hands echoed the slight purple color at the top of the face; it also created contrast that thrust the hands to the foreground. I completed the face using the flesh tone formula, adding ochre, red or white in different amounts to achieve shading. I may have undercut the prowess of my one-line drawing by painting lines for the closed eyes, brows, forehead, nose and mouth. But it didn’t look quite right without them. As in yesterday’s post, this study has a simple structure. It is nearly identical, in fact. The only difference is in the position of the head. Today it is upright, yesterday it was in repose. The dream state of yesterday’s composition was depicted by a mix of colors. The only indication of an internal process shown above is the subtle expression on the face. I like the simplicity of design and the low contrast color scheme. Now if I can only simplify it more… Something to work on. This entry was posted in Personal Stories and tagged abstract expressionism, art, artistic process, creativity, drawing, low contrast, mental processes, painting, portraiture, sketching, taking a line for a walk, visual depiction, watercolor. Bookmark the permalink.